Search Westside and Downtown Bend Homes for Sale below! The Deschutes River flows through Mirror Pond, at Drake Park in downtown Bend. 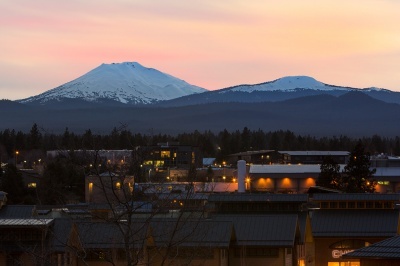 The mountains are visible from many home sites, and there are river trails, mountain bike trails, and many parks within close proximity to downtown Bend. This side of town also has the quickest route to Mt. Bachelor. Many of the home owners on the West side of Bend have the luxury of walking to a grocery store, restaurant, or one of the many local pubs. There is also an abundance of shopping and boutiques on Bend's West side. In the summer you'll find all kinds of activities at the popular Drake Park near downtown. These festivities include Munch N Music every Thursday night and a Farmers Market on Wednesdays. The old west side neighborhoods were built in the early 1900's, but there is also a variety of newer construction elsewhere on this side of town. Explore the Downtown Bend real estate listings available below, or read more about this vibrant and eclectic area of the city! 221 Properties Found. Page 1 of 19. Live the Bend lifestyle by living close to the many breweries, river, mountain bike trails and more. The walkability of the downtown area makes it very attractive. You'll find a bit of every architectural style on the westside. There are large turn of the century homes around the Drake Park area, smaller historic homes between downtown and the Old Mill, and a mix of new construction, modern, and craftsman homes of all ages on the westside. Luxury neighborhoods include Broken Top, Tetherow, and Awbrey Butte. Homes for sale on the westside of Bend sell quickly, so contact Dylan today to get a list of homes available and receive new westside listings as they come on the market matching your property needs. Dylan specializes in selling westside and downtown Bend real estate. If you'd like to learn more about making a home in downtown Bend, Oregon, please contact Sedonia Darling online or call (541) 749-0509 to connect with a dedicated Bend real estate professional!